2018-07-23: Faust Awards 2018 to iPlug 2 ! 2016-10-17: Faust Awards 2016: Ambitools ! 2016-08-30: The first FAUST book is Korean ! 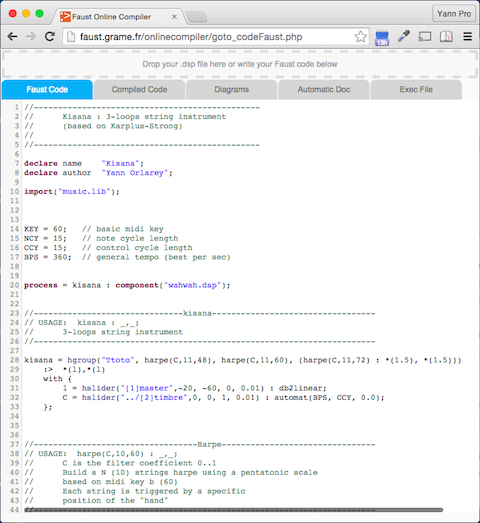 2015-09-11: The Faust Online Compiler is back! View the evolution of the Faust project from 2004 to 2018. The Faust Open Source Software Competition aims at promoting innovative high-quality free audio software developed with Faust, a functional programming language for realtime signal processing and sound synthesis. The competition is sponsored by GRAME, Centre National de Création Musicale. to iPlug 2 a free open source C++ audio plug-in framework, allowing developers to create audio plug-ins and apps across a wide range of formats from the same code, including graphical user interface and DSP components. Amongst many other new features and a reworked code base, version 2 includes support for FAUST, allowing sections of audio DSP to be implemented using the FAUST language, and easily integrated with other C++ elements. iPlug 2 is developed by Oliver Larkin and Alex Harker from the original iPlug, by Cockos inc. that was open sourced in 2008. The project is under active development and will be publicly released at the end of 2018. The jury praised the quality, the ambition, and the usefulness of iPlug 2 as a Faust development framework! Check the demo here. 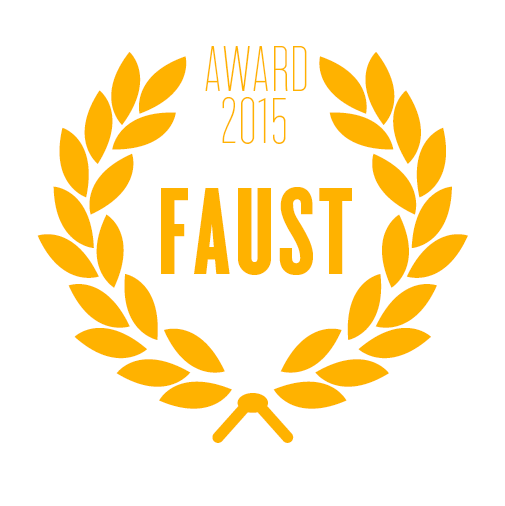 We hope that the Faust Award will help the authors to fully finalize the project. In parallel to the main competition, the Faust Student Software Competition, is intended to promote small, but innovative Faust applications, typically developed in the framework of student projects. The student prize 2018 was awarded to Cloud Generator a nine-voice polyphonic synthesizer developed by Rittik Wystup. The jury praised the audio quality and the care taken by Rittik Wystup in his project! Check the Cloud Generator demo here. The International Faust Conference IFC18 will take place at the Johannes Gutenberg University of Mainz (Germany) on July 17-18, 2018. It aims at gathering developers and users of the Faust programming language to present current projects and discuss future directions for Faust and its community. Participants will be able to share their work through paper presentations. A series of round tables on various topics will serve as a platform to brainstorm on Faust’s features, semantics, tools, applications, etc. to determine future directions for this language. Open spaces for demos and workshops will be available for participants to openly share their ongoing projects with the rest of the community. As a special event, the winner of GRAME’s Faust Open-Source Software Competition will be announced during IFC18. The Faust Open-Source Software Competition is intended to promote innovative high-quality free audio software developed with the Faust programming language, as well as development tools built around the Faust compiler itself. The Faust Open-Source Software award will be attributed to the best submission by an international committee of leading experts in the field. The competition is sponsored by Grame, centre national de création musicale. The winning software will receive a 2000€ price to encourage its authors. The results will be announced July 17, 2018 during the International Faust Conference in Mainz IFC18. To participate, the software must be provided with source code and licensed with a Free/Open Source license. A substantial part of the software must be written in Faust and the Faust source code must be provided. As part of the review process, the software will be built from the sources. All source code, license, video demonstration, installation instructions, and any other documentation must be available on a public web page. License compatibility with other open source software is encouraged. Dependencies on non-open source third-party software are discouraged, with the exception of operating systems and freely available commercial packages. Authors are required to prepare a video demonstrating the software. This video must be done carefully, and should convincingly present the qualities of the software. The submission must also contain any useful documentation, including examples of how the provided software might be used, existing prototypes that use the software, download statistics or other public usage information. The criteria for judging submissions includes broad applicability and potential impact, novelty, technical depth, reusability, etc. cat foo.dsp | stripcmt | wc -w.
The use of the standard Faust libraries is strongly encouraged. They don’t take part in the word count. A link to a compressed archive file that contains the software (source code, documentation, build/install instructions, and licenses). Comprehensive and clear build/install instructions will be a crucial component of any submission. The committee will make a reasonable effort to build the software for the top contributions, but if they are unable to make the software run, it will be excluded from the competition. 2016: Ambitools, by Pierre Lecomte; Student prize: TouchVoices, by Pierre-Adrien Théo. WebAudio wasm benchmark pages and tools allow to test statically generated HTML pages from Faust DSP. Audio generating pages in ScriptProcessor or AudioWorklet mode can be tested first. DSP CPU benchmark pages can be used to test the perfomance of wasm code across different browsers. Tools to generate new DSP CPU benchmark pages are also available, and finally a page allowing to test the dynamic compilation chain can be acccesed. Simple pages can be used to test simple monophonic and polyphonic DSP, generated as ScriptProcessor or AudioWorklet WebAudio nodes. More complex statically generated polyphonic MIDI aware pages can be tested. A set of statically generated pages allow to measure the DSP CPU use of Faust generated WebAssemby code. The compute method is repeatedly called in a loop (taking 100% of a core) which duration is measured. Results as MBytes/sec as well a DSP CPU load in % of a 1024 frames, 44.1 kHz audio buffer are displayed. On OSX for instance, open the Activity Monitor tool and look as your browser CPU use. Then hit the checkbox to start playing, and hit it again to stop it. Silence should be produced, but actually very small sample values (= subnormals) are generated. If your machine uses an Intel CPU, you will see CPU raise quite rapidly ! (tested on a MacBook Pro OSX El Capitan 2,2 GHz Intel Core i7). For developers, benchmark tools allow to generate HTML pages to test your DSP. Look in particular at the faust2benchwasm script. A more complete testing page for monophonic and polyphonic MIDI aware DSP, ScriptProcessor or AudioWorklet mode, FTZ selection mode is available here. The International Faust Conference IFC-18 will take place at the Johannes Gutenberg University of Mainz (Germany) on July 17-18, 2018. It aims at gathering developers and users of the Faust programming language to present current projects and discuss future directions for Faust and its community. Participants will be able to share their work through paper presentations. A series of round tables on various topics will serve as a platform to brainstorm on Faust’s features, semantics, tools, applications, etc. to determine future directions for this language. Open spaces for demos and workshops will be available for participants to openly share their ongoing projects with the rest of the community. As a special event, the winner of GRAME’s Faust Open-Source Software Competition will be announced during IFC-18. IFC-18 is free and everyone is welcome to attend! Paper should be up to 14 pages in length, non anonymous, and formatted according to this template. Submissions should be carried out via our EasyChair portal. All submissions are subject to peer review. Acceptance may be conditional upon changes being made to the paper as directed by reviewers. Accepted papers will be published on-line as well as in the IFC-18 proceedings paper version. They will be presented by their author(s) at IFC-18 as 15 minutes presentations (+ 5 minutes for questions). We solicit topic suggestions from the Faust community for each of these themes. Topics can be submitted by means of this Google form. They will be introduced during the round tables by the session chair. We are very happy to announce the online Faust Editor. It can be used to edit, compile and run Faust code from any recent Web Browser with WebAssembly support. This editor works completely on the client side and it is therefore very convenient for situations with many simultaneous users (workshops, classrooms, etc.). It embeds the latest version of the Faust compiler with an efficient WebAssembly backend and offers polyphonic MIDI support. The editor engine is based on codemirror. It offers syntax highlighting, auto completion and direct access to the online documentation. The documentation command (ctrl-d) uses the function name at the cursor position to locate to the relevant information. The recommended browsers are the latest versions of Firefox and Chrome. Chrome is recommended for MIDI, but it requires an https connexion to use the audio inputs. On the other hand MIDI is not supported by Firefox. Porting and running large C/C++ code base on the Web have been the subject of several competing projects in the recent years, from Google NaCl/PNaCl to Mozilla asm.js. Recently standardized WebAssembly language inherits from ideas experimented in both approaches, with the Mozilla vision finnally winning as Robert O’Callahan explains here. 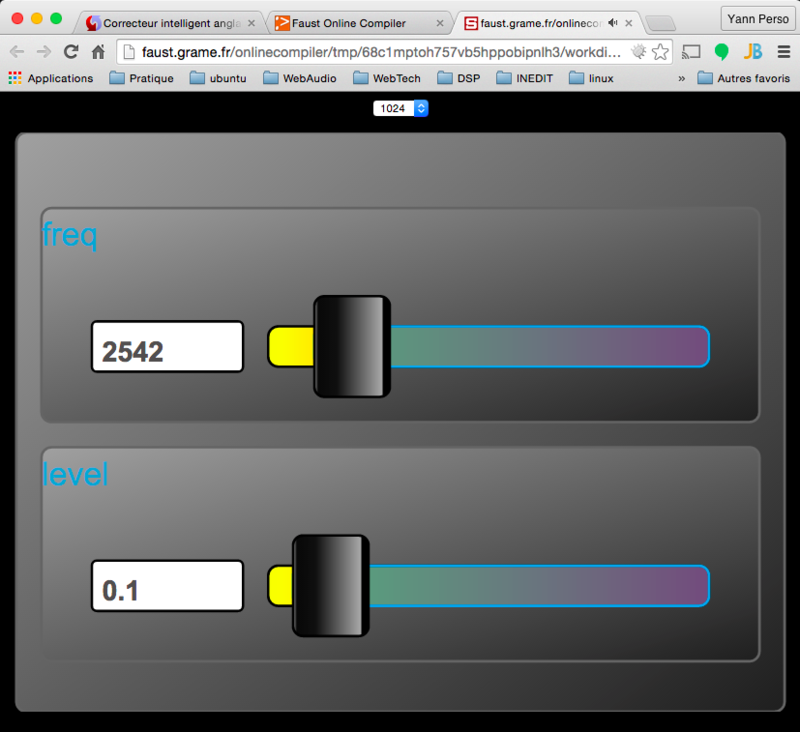 Coupled with the WebAudio API, running real-time audio code in the Web now appears to be an achievable goal. The Faust ecosystem already allows to generate static or dynamically compiled WebAssembly based WebAudio nodes. These nodes are still using the deprecated ScriptProcessor WebAudio interface. Premillinary work has been started to be ready as soon at the AudioWorklet model will be testable. In the meantime, work have been started using the WAVM, a standalone VM for WebAssembly, that can load both the standard binary and text wasm format, compiling it in native code using the LLVM chain (generating LLVM IR and compiling it on the fly to native code using LLVM JIT compiler), and running it at (near) native speed. Glue code to load and run Faust generated wasm modules has been written. Validation and benchmarking tools have been developed. 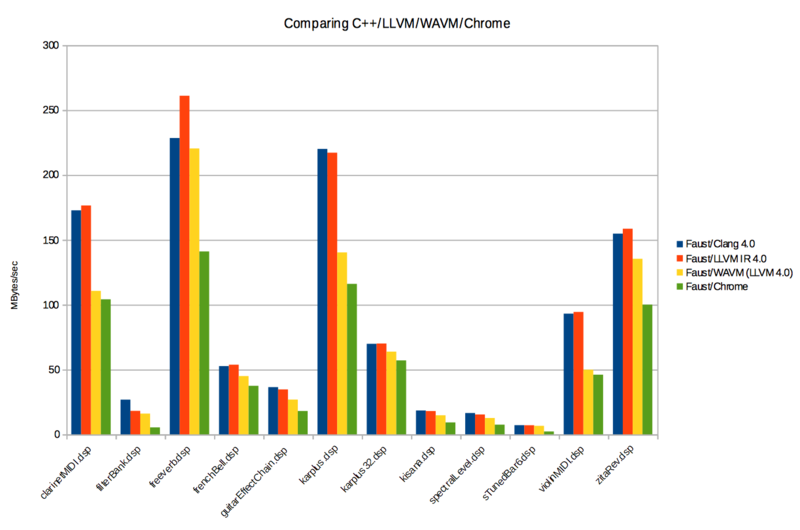 Performances comparison with the C++ and LLVM IR Faust backends is the subject of this post. The WebAssembly approach promises near native performances for C/C++ written code compiled to WebAssembly using the Emscripten tool chain. Other languages like Rust (using the mir2wasm tool) experiment direct WebAssembly generation. It seems clear that as WebAssembly specification and implementation stabilize, more and more languages will directly generate wasm to be deployed in browsers. The question of the quality of code generation at each step of the compilation chain will rapidly emerge. While WebAssembly is initially designed to run on the Web, it may be deployed in non Web environnement like nodejs, or even in standalone VM like WAVM. Thus WebAssembly becomes a portable binary format that can be used in a large variety of situations. This is especially of interest for a DSL language like Faust. in monophonic mode the wast/mast module internally allocates a memory block to be used for the DSP state (controllers, delays lines, waveforms…) as well as audio buffers. in polyphonic mode, the memory block will be allocated by the loader environnement. This block will typically be sized to contain all the needed voices for the polyphonic DSP. In both cases, a full description of the DSP state as a JSON string is generated in the module data segment (including memory indexes of all controllers). Loader code will get and decode this JSON description, and use whatever parts of the description it needs to run the DSP code. In particular, control memory zones (corresponding to the UI items like buttons, sliders, bargraph…) can be directly read/written by the wrapper code. The diagrams clearly shows that the wasm code is still slower than C++ or LLVM IR code, but speed difference is not so high in most cases. Some DSP behaviours need to be understood in more details. removing the atomic flag in all load/store that are added to pass all spec WebAssembly tests. adding the equivalent of -fast-math compilation flag that have to be done at LLVM IR and JIT (= native) generation steps. and finally simplifying some mathematical operators, using their standard definition instead of the specific WAVM coded ones that strictly implement WebAssembly official semantic (see for instance the definition of f32.min/f32.max operations). After generating the LLVM IR code, the WAVM runtime runs a set of LLVM IR to IR optimizations passes. 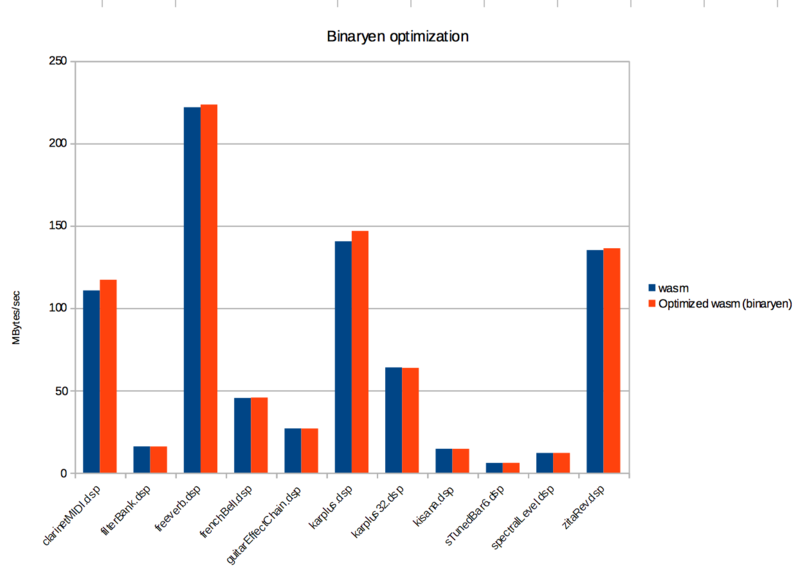 It remains to be tested if adding more optimization passes (especially the auto-vectorizations ones) could help producing even better code. A specific problem occurs when audio computation produces denormal float values, which is quite common with recursive filters, and can be extremely costly to compute on some processors like the Intel family for instance. 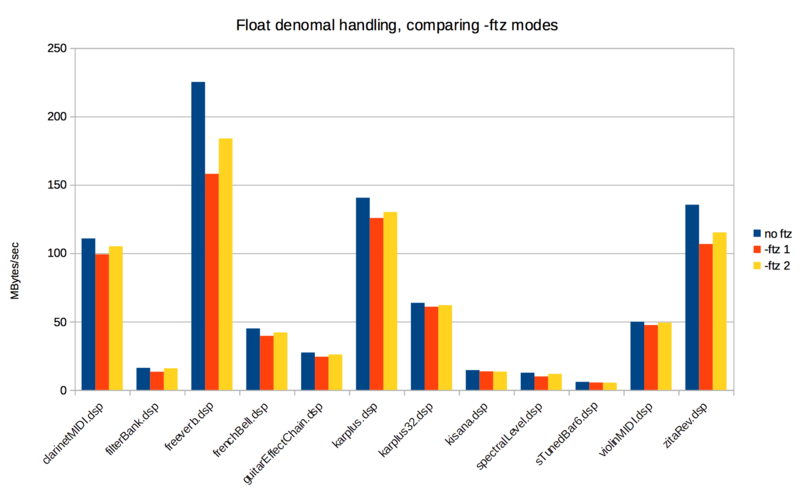 A Flush To Zero (FTZ) mode for denormals can usually be set at hardware level, but it not yet available in the WebAssembly MVP version, which strictly conform to the IEEE 754 norm 8. Thus an automatic software strategy which consists in adding FTZ code in all recursive loops has been implemented in the Faust compiler. To activate it, the -ftz compilation parameter must be used at compilation time. The -ftz 1 mode adds a test in each recursive loop which uses the fabs function and a threshold to detect subnormal samples (slower). The -ftz 2 mode adds a test in each recursive loop which uses a mask to detect subnormal samples (faster). Testing wasm JIT machines inside browsers is not an easy task. 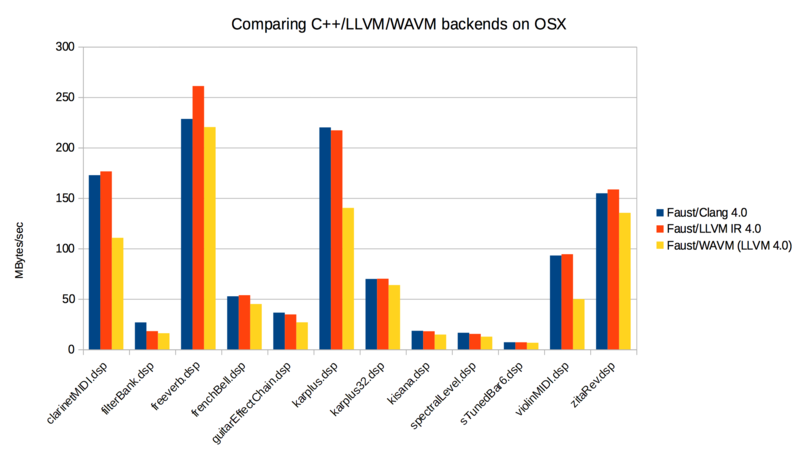 The C++ WAVM runtime revealed to be an excellent tool to compare the Faust C++, LLVM IR and wasm backend. Since its code can be easily adapted, one can estimate also what can be expected deploying wasm DSP modules in pure native environments, outside of the browser, where some audio specific optimizations may be considered. Measures done on a set of Faust DSP show that WebAssembly code still run slower than C++ or LLVM IR generated code in most cases, up to almost 66% slower in the less favorable examples. This value will typically be a bit worse when deploying in browsers, since float denormal protection code has to be used. 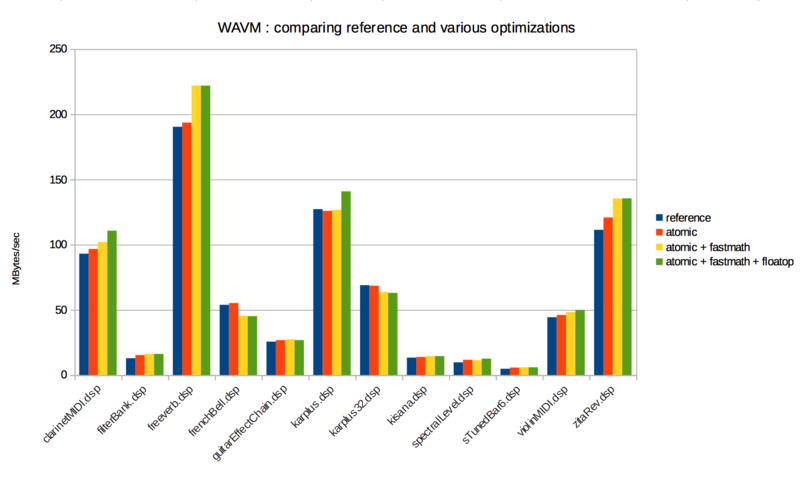 Benchmarks in browser wasm runtime still need to be done to confirm or refine these findings. 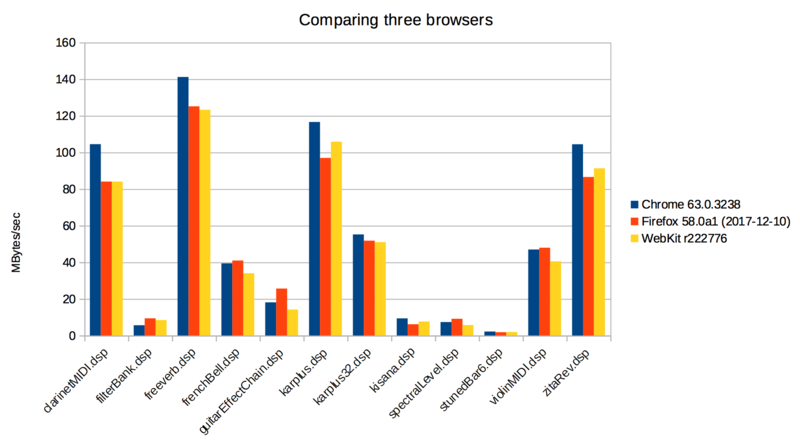 Comparing the Chrome, Firefox and WebKit browsers on OSX El Capitan shows that Chrome is currently the fastest engine in most cases, with Firefox and WebKit quite similar (with a slight plus for WebKit). Comparing the Chrome browser with native engines shows results from 4,8 times slower (filterBank.dsp), 2,8 times slower (sTunedBar6.dsp) up to much more favorable cases (karplus32.dsp). Note that filterBank.dsp example is a bit of a pathological case, since Chrome is significantly slower than Firefox and WebKit in this case, and filterBank.dsp uses a lot of pow(10, x) code that is rewritten an optimized as exp10(x) with the C++ backend path. Using latest developments done for the Web (the new WebAssembly backends and libfaust library compiled in WebAssembly with Emscripten), statically and dynamically Faust generated WebAudio nodes can be easily produced and deployed on the Web. Look at the Noise and OSC online pages for the complete code. Note that pages loading an additional .wasm file cannot directly be loaded in Chrome. You’ll have to start a local server (using the python -m SimpleHTTPServer command for instance) and access them with their http:// based URL. * Instantiates a new polyphonic voice. * De-instantiates a polyphonic voice. * Gently terminates all the active voices. Assuming that the compiled Faust DSP file is polyphonic ready, the -poly parameter can be used to generate a polyphonic MIDI controlable instrument, to be used with a MIDI application or device. The -links generates the DSP processor SVG representation, and links to the original DSP file as well as generated SVG files, so that the HTML page can possibly be deployed as a reusable Faust DSP resource. Assuming that you have Binaryen tools installed on your machine, the faust2wasm and faust2webaudiowasm scripts can take an additional -opt parameter to allow WebAssembly module optimization. The Dynamic OSC page demonstrates the dynamic OSC complete code (based on the example seen before). The Dynamic Organ page demonstrates a polyphonic organ instrument, which loads a DSP from an url, and ready to be controlled with a MIDI device or application. Look at the Dynamic Faust compiler page for a more complete use-case of the dynamic compiler. From a DSP source file, the Faust compiler typically generates a C++ class. When a rdtable item is used on the source code, the C++ class will contain a table shared by all instances of the class. By default, this table is generated as a static class array, and so allocated in the application global static memory. In some specific case (usually in more constrained deployment cases), managing where this data is allocated is crucial. By extension this post explains how a custom memory allocator can be used to precisely control the DSP memory allocation. The two itbl0 and ftbl0 tables are static class arrays. They are filled in the classInit method. The architecture code will typically call the init method (which calls classInit) on a given DSP, to allocate class related arrays and the DSP itself. If several DSP are going to be allocated, calling classInit only once then the instanceInit method on each allocated DSP is the way to go. The two itbl0 and ftbl0 tables are generated a class static pointers. The classInit method takes the additional dsp_memory_manager object used to allocate tables. A new classDestroy method is available to deallocate the tables. Finally the init method is now empty, since the architecure file is supposed to use the classInit/classDestroy method once to allocate and deallocate static tables, and the instanceInit method on each allocated DSP. More complex custom memory allocators can be developed by refining this malloc_memory_manager example, possibly defining real-time memory allocators…etc… The OWL architecture file already uses this new custom memory allocator model. custom memory allocator is not yet supported is additional DSP classes (like the mydsp_poly defined in the achitecture/faust/dsp/poly-dsp.h header). The Faust compiler has as lot of different compilation parameters to play with. Discovering them for a given DSP program is something that can be automated. Two measure_dsp and dsp_optimizer classes are available for developers to measure DSP CPU use directly in their code. Two more friendly faustbench and faustbench-llvm tools have been developed using them. They allow to discover the best Faust compiler parameters, to be used later on with faust2xx scripts, faustgen~ Max/MSP external or FaustLive. JUCE is an open-source cross-platform C++ application framework, used for the development of desktop and mobile applications. JUCE is used in particular for its GUI and plugins libraries. A set of architecture files have been developed to deploy standalone or plugins built from Faust code. They allow to automatically generate the GUI from the Faust program, possibly supporting polyphonic instruments, and be controlled by MIDI or OSC messages. The architecture files are then combined to produce ready to compile JUCE applications or plugins, using tools that are part of the Faust distribution. They can also be accessed using the Faust online compiler. faust2juce transforms a Faust DSP program into a fully working JUCE standalone application or plugin, which can possibly be controlled with MIDI or OSC messages. Read its complete description here. You’ll have to get a recent github version of Faust tree to use it. Directly using faust2juce provides the full control of the generated target with access to all possible compilation parameters. An alternative to faust2juce static-compilation model, is to use Oliver Larkin’s juce_faustllvm module, also used in his pMix2 tool. WebAssembly was born with the premise of creating a safe, portable and fast to load and execute format suitable for the web. WebAssembly its not a programing language but a compilation target with a text and binary specs. That means that other low level languages like C/C++, Rust, Swift, etc. can compile to WebAssembly. Specified and developed by principal browser compagnies (Google, Mozilla, Microsoft and Apple), this new format aims to finally replace the more hackish “asm.js” format initialy developed by Mozilla. See a preview of Microsoft Edge support and follow Safari support on WebKit’s feature status. New WebAssembly backends have been added in the faust2 development branch. They allow to generate textual or binary WebAssembly code. The ‘wast’ backend allows to generate textual WebAssembly code (in s-expression like format). Note that as of january 2017, the official textual format is not yet fully specified, thus we follow the format used in the binaryen tool. Use the following command to generate the textual output in the terminal for a given foo.dsp file. The ‘wasm’ backend allows to generate binary WebAssembly code. Use the following command to generate the binary output in the terminal for a given foo.dsp file. will generate the textual WebAssembly output, use binaryen wasm-as tool to convert the wast to wasm format (you’ll have to compile and install the binaryen tools on your machine), and produce a self-contained html page. will generate the binary WebAssembly output that can directly be loaded by the produced self-contained html page. to use the ‘wast’ backend and a polyphonic ready foo.dsp, and create a self-contained html page ready to be used with a MIDI instrument. to use the ‘wasm’ backend and a polyphonic ready foo.dsp, and create a self-contained html page ready to be used with a MIDI instrument. to Ambitools, a set of tools for real-time 3D sound field synthesis using higher order ambisonics (HOA). Ambitools is developed by Pierre Lecomte, a PhD candidate at Conservatoire National des Arts et Métiers and Sherbrooke University. The core of the sound processing is written in Faust. The tools contain HOA encoders, decoders, binaural-filters, HOA signals transformations, spherical VU-Meter, etc. and can be compiled in various plug-ins format under Windows, Mac OSX, and Linux. The jury praised the quality and the usefulness of Ambitools: a really useful and technically advanced Faust app and an impressive technical achievement ! Check the demo. Voice of Faust, a voice synthesizer/effects machine by Bart Brouns (demo). PMix, a graphical patcher, preset interpolator and JIT compiler for FAUST by Oliver Larkin (demo). In parallel to the main competition, we introduced this year a junior competition: the Faust Student Software Competition, intended to promote small but interesting Faust applications, typically written as student projects. The student prize was awarded to TouchVoices (by Pierre-Adrien Théo, RIM Master student at University Jean Monnet) a real-time web application allowing to capture, playback and transform sound loops. Here is a video of Pierre-Adrien Théo during a performance with TouchVoices. A very close competitor was SuperBeatRepeater (by Vincent Rateau, of SuperDirt fame), a sample accurate beat repeater. Don’t miss the demo! 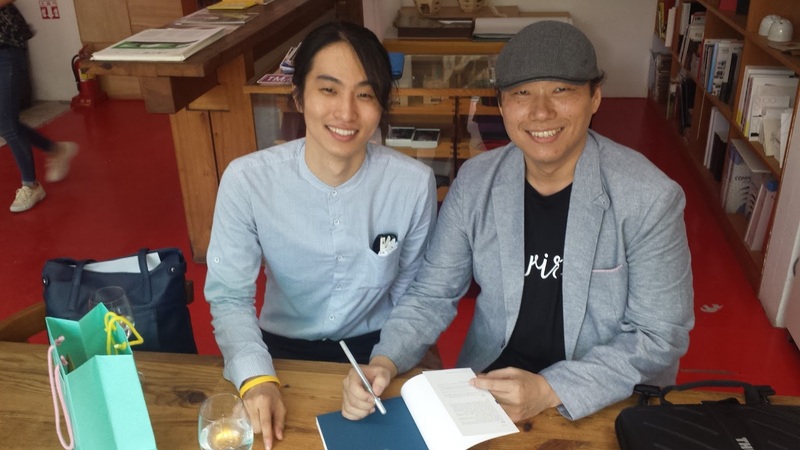 “Sound Programming using FAUST”, written by Jin-Wook Chae, an experienced audio developer and sound engineer (right) and Hyun-Hoo Jung (left), is the very first book ever published on FAUST. While the book is written in Korean, I was able to really appreciate the choice of the examples and the elegance as well as the high quality of the code. 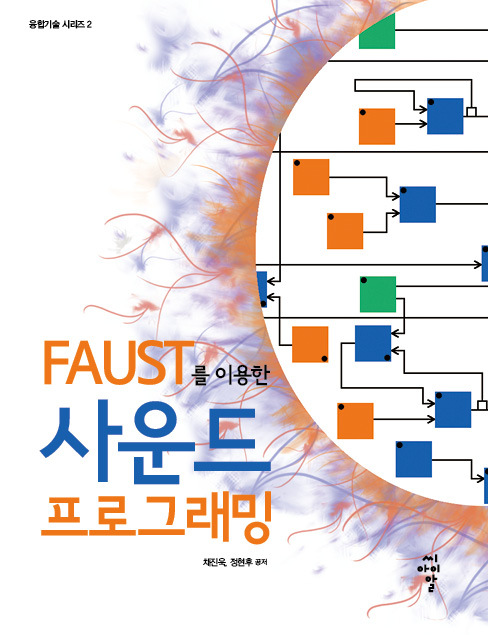 I am sure it will be an invaluable tool to promote FAUST in Korea among sound engineering, computer music students and more generally any person interested in sound programming. This book is for people desiring to produce musical instruments or sound processors. I have always been instructing my students that the ultimate importance is to discover interesting ideas about the sound. In spite of that, I have often relied on an unflattering response such as “you may need to learn a programming language like C/C++…” when a student asked for help with how to execute his/her ideas related to sound. Now I am pleased to recommend the use of FAUST to bring such ideas into execution. This is an easy self-study guide that can help to do just that. Now I can confidently tell anybody pursuing sound or electronic music that their exciting and brilliant idea about sound is what truly counts! So, really, how do we execute our ideas? Today I am introducing you to FAUST and to this book which you will find immensely helpful in terms of how to use FAUST to bring your fabulous ideas into reality. A new ‘interpreter’ backend has been added in the faust2 development branch. It allows to execute Faust programs without using the LLVM dynamic compiler chain. The dynamic compilation chain allows developers to embed the Faust compiler technology directly in their application or plugins. Faust2 development branch uses an intermediate FIR representation (Faust Imperative Representation), which can be translated to several output languages. An LLVM backend has been previously developed to allows applications to compile a DSP source into executable code in memory, bypassing the external compiler requirement. In some specific situations, embedding the LLVM chain is not possible : for instance Apple does not allow to deploy dynamic compilers on iOS. Thus having an interpreter backend allows to get around this problem and still make Faust code run on those platforms. The interpreter backend translates the FIR intermediate language into instructions for a virtual machine. A pure C++ interpreter for this instruction set has been implemented. The interpreter backend translates the FIR intermediate language into bytecode for a virtual machine. It allows to run programs about 4 to 5 slower than native speed. Moreover this interpreter can be compiled in a special ‘trace’ mode to automatically detect various execution errors : invalid heap access, mathematical errors or warnings (division by zero, integer overloading….) which helps us to check the compiler semantic and code generation quality. Given a Faust source code (as a file or a string), calling the createInterpreterDSPFactoryXXX function runs the compilation chain (Faust + interpreter) and generates the “prototype” of the class, as a interpreter-dsp-factory pointer. Note that the library keeps an internal cache of all allocated factories so that the compilation of the same DSP code, that is same source code and same set of ‘normalized’ (= sorted in a canonical order) compilations options, will return the same (reference counted) factory pointer. You will have to explicitly use deleteInterpreterDSPFactory to properly decrement the reference counter when the factory is no more needed. You can get a unique SHA1 key of the created factory using its getSHAKey method. Next, the createDSPInstance function, corresponding to the new className of C++, instantiates a interpreter-dsp pointer to be used through its interface, connected to the audio chain and controller interfaces. When finished, simply use delete to destroy the dsp instance. Since interpreter_dsp is a subclass of the dsp base class, an object of this type can be used with all already available audio and UI classes, in essence reusing all architecture files already developed for the static C++ class compilation scheme (like OSCUI, httpdUI interfaces etc. ), see Developing a new architecture file. readInterpreterDSPFactoryFromMachine allows to create a DSP factory from a string containing the interpreter bytecode, readInterpreterDSPFactoryFromMachineFile allows to create a DSP factory from a file containing the interpreter bytecode. The complete API is available and documented in the installed faust/dsp/interpreter-dsp.h header. where ‘code’ is the DSP source as a string, and ‘arguments’ is an array of parameters to be given to the Faust compiler (like ‘-vec’, ‘-vs 512’…), and ‘callback’ is a function taking the created ‘factory’ as argument. This instance can be used like the statically compiled one, as previously described in this page. The Faust Open-Source Software Competition is intended to promote innovative high-quality free audio software developed with the Faust programming language, as well as development tools build around the Faust compiler itself. The Faust Open-Source Software award will be attributed to the best submission by an international committee of leading experts in the field. The competition is sponsored by Grame, centre national de création musicale. The winning software will receive a 2000€ price to encourage its authors. The results will be announced July 15, 2016. Faust programs can be controlled using MIDI messages. Thanks to the metadata mechanism, all UI elements (sliders, button, bargraph…) can send and receive MIDI data. MIDI control messages are described as metadata in UI elements. They are decoded by a new MidiUI class that will parse incoming MIDI messages and update the appropriate control parameters, or send MIDI when the UI elements (sliders, buttons….) are moved. [midi:pitchwheel] in a slider or bargraph will map the UI element value to (0,16383) range. When used with a button or checkbox, 1 will be mapped to 16383, 0 will be mapped to 0. [midi:clock] in a button or checkbox will deliver a sequence of successive 1 and 0 values each time a clock MIDI message is received, seen by seen by Faust code as a square command signal, to be used to compute higher level information. .
use faust2alqt -midi foo.dsp to create a MIDI aware ALSA/QT application on Linux. Note that the buildUserInterface method for polyphonic instruments (defined using the mydsp_poly class) called with a MidiUI object, will automatically connect to the MIDI system, to be ready to handle incoming keyOn/keyOff MIDI messages and so on. See Creating polyphonic instruments page for more informations. Polyphonic instruments can be created by “combining” several voices using a specific architecture file, with the single voice described by a Faust DSP program. The architecture file takes care of dynamic voice allocation and control MIDI messages decoding and mapping. First you’ll have to describe the voice in Faust, then use the mydsp_poly class to combine several voices. By convention Faust architecture files with polyphonic capabilities expect to find a user interface parameters with the following freq, gain and gate names. The metadata declare nvoices “8”; kind of line with a desired value of voices can be added in the source code. In case of MIDI control, the freq (which should be a frequency) will be automatically mapped to MIDI note numbers, gain (which should be a value between 0 and 1) to velocity and freq to keyon/keyoff events. Thus, gate can be used as a trigger signal for any envelope generator, etc. Look at the A Simple Organ post for a complete example. Use the faust/dsp/poly-dsp.h file to wrap the dsp voice into the polyphonic architecture. This file defines the mydsp_poly class (a sub-class of base class dsp) that maintains and array of dsp objects, manage dynamic voice allocation, control MIDI messages decoding and mapping, and mixing of all running voices (stopping a running voice, when its output level decreases below a given threshold). As a sub-class of dsp, the mydsp_poly class redefines the buildUserInterface method. By convention all allocated voices are grouped in a global “tabgroup”, so that a user interface builder may display them separately. The first tab contains a Voices group that can be used to change parameters on all voices at the same time. A Panic button can be used to stop running voices. This dsp object can be used as usual and connected with the wanted audio driver and possibly other UI control objects like OSCUI, httpdUI, etc. Having this UI hierarchical view allows for instance complete OSC control of each single voice and its control parameters. Note that mydsp_poly class is also ready for MIDI control and can react to keyon/keyon and pitchwheel messages. You can also add other MIDI control parameters directly in the dsp source code. See Controlling with MIDI post for more informations. Several architecture files and associated scripts have been updated to handle polyphonic instruments. As an example on OSX, the script faustcaqt foo.dsp can be used to create a polyphonic CoreAudio/QT application. The desired number of voices is either declared in a nvoices metadata or changed with the -nvoices num additional parameter (-nvoices parameter takes precedence over the metadata value). MIDI control is activated using the -midi parameter. The number of allocated voice can possibly be changed at runtime using the -nvoices parameter to change the default value (so using ./foo -nvoices 16 for instance). Several other scripts (faust2jaqt, faust2ios…) have been adapted using the same conventions. Polyphonic instruments can be used with a global output effect. Putting that effect in the main Faust code is not a good idea since it would be instantiated for each voice which would be very inefficient. The -effect effect.dsp paramter has to be used in the script. The number of outputs of the instrument must the same as the number of inputs of the effect. Polyphonic ready faust2xx scripts will then compile the polyphonic instrument and the effect, combine them in sequence, and create a ready to use dsp. As an example on OSX, faustcaqt -nvoices 8 -effect freeverb.dsp -midi synth.dsp script can be used to combine the instrument and the output effect, and make it MIDI controllable. Yan Michalevsky’s VSTi support is part of the regular Faust distribution. Look at the vsp.cpp architecture file, to be used with the faust2vsti script. Albert Graef LV2 and VSTi separately developed but which are also part of the standard Faust distribution. The dynamic compilation chain allows developers to embed the Faust compiler technology directly in their application or plugins. Thanks to the awesome LLVM technology combined with libfaust, the new library version of the Faust compiler, Faust DSP programs can now directly be compiled and executed on the fly at full speed. Faust2 development branch uses an intermediate FIR representation (Faust Imperative Representation), which can be translated to several output languages. The FIR language describes the computation performed on the samples in a generic manner. It contains primitives to read and write variables and arrays, do arithmetic operations, and define the necessary control structures (for and while loops, if structure etc.). The language of signals (internal to the Faust compiler) is now compiled in FIR intermediate language. LLVM (formerly Low Level Virtual Machine) is a compiler infrastructure, designed for compile-time, link-time, run-time optimization of programs written in arbitrary programming languages. Executable code is produced dynamically using a “Just In Time” compiler from a specific code representation, called LLVM IR. Clang, the “LLVM native” C/C++/Objective- C compiler is a front-end for LLVM Compiler. It can, for instance, convert a C or C++ source file into LLVM IR code. Domain-specific languages like Faust can easily target the LLVM IR. This has been done by developing a special LLVM IR backend in the Faust compiler. The complete chain goes from the Faust DSP source code, compiled in LLVM IR using the LLVM backend, to finally produce the executable code using the LLVM JIT. All steps take place in memory, getting rid of the classical file based approaches. Pointers to executable functions can be retrieved from the resulting LLVM module and the code directly called with the appropriate parameters. In the Faust2 development branch, the Faust compiler has been packaged as an embeddable library called libfaust, published with an associated API that imitates the concept of oriented-object languages, like C++. Given a Faust source code (as a file or a string), calling the createDSPFactoryXXX function runs the compilation chain (Faust + LLVM JIT) and generates the “prototype” of the class, as a llvm_dsp_factory pointer. Note that the library keeps an internal cache of all allocated factories so that the compilation of the same DSP code, that is same source code and same set of ‘normalized’ (= sorted in a canonical order) compilations options, will return the same (reference counted) factory pointer. You will have to explicitly use deleteDSPFactory to properly decrement the reference counter when the factory is no more needed. You can get a unique SHA1 key of the created factory using its getSHAKey method. Next, the createDSPInstance function, corresponding to the new className of C++, instantiates a llvm_dsp pointer to be used through its interface, connected to the audio chain and controller interfaces. When finished, use deleteDSPInstance to destroy the dsp instance. Since llvm_dsp is a subclass of the dsp base class, an object of this type can be used with all already available audio and UI classes, in essence reusing all architecture files already developed for the static C++ class compilation scheme (like OSCUI, httpdUI interfaces etc. ), see Developing a new architecture file. writeDSPFactoryToMachine allows to get the executable machine code as a string, writeDSPFactoryToMachineFile allows to save the executable machine code in a file. readDSPFactoryFromMachine allows to create a DSP factory from a string containing the executable machine code, readDSPFactoryFromMachineFile allows to create a DSP factory from a file containing the executable machine code. generateAuxFilesFromString/generateAuxFilesFromFile: from a DSP source string or file, generates auxiliary files: SVG, XML, ps… depending of the ‘argv’ parameters. The libfaust library is part of the Faust2 development branch. You’ll have to compile and install it. Then look at the installed faust/dsp/llvm-dsp.h header for a complete description of the API. Note that faust/dsp/llvm-c-dsp.h is a pure C version of the same API. Being a high-level specification language, the Faust code says nothing about the audio drivers, the GUI toolkit, or any other non-GUI interface to be used to control the dsp. It is the role of the architecture file to describe how to relate the dsp code to the external world. This approach allows a single Faust program to be easily deployed to a large variety of audio standards (Max/MSP externals, PD externals, VST plugins, CoreAudio applications, JACK applications, etc.). compute is called by the audio architecture to execute the actual audio processing. It takes as a count number of samples to process, inputs and outputs arrays of non-interleaved float/double samples, to be allocated and handled by the audio driver with the required dsp input and ouputs channels (as given by getNumInputs, getNumOutputs). (note that FAUSTFLOAT label is typically defined to be the actual type of sample : either float or double using #define FAUSTFLOAT float in the code for instance). Note that by default mydsp is used as the name of the created class. You may need to use the -cn name Faust compiler parameter to possibly generate another class name, especially if you need to compile several Faust generated C++ classes in a same context and avoid name clashes. Faust audio architecture is a glue between the host audio system and a Faust module. It is responsible to allocate and release audio channels and to call the Faust dsp::compute method to handle incoming audio buffers and/or to produce audio output buffers. It is also responsible to present the audio as non-interleaved float/double data, normalized between -1 and 1. The API is simple enough to give a great flexibility to audio architectures implementations. The init method should initialize the audio underlying driver. The start method begins the actual audio processing, until stop method is called. A concrete implementation of audio class will typically get buffer size and sample rate driver parameters in its contructor. So get_buffer_size and get_sample_rate methods can be used to retrieve those values, or the one actually choosen by the driver. A Faust UI architecture is a glue between a host control layer and a Faust module. It is responsible to associate a Faust control parameter to a user interface element and to update the parameter value according to the user actions. This association is triggered by the dsp::buildUserInterface call, where the dsp asks a UI object to build the module controllers. Since the interface is basically graphic oriented, the main concepts are widget based: an UI architecture is semantically oriented to handle active widgets, passive widgets and widgets layout. The FAUSTFLOAT* zone element is the primary connection point between the control interface and the dsp code. The compiled dsp Faust code will give access to all internal control value addresses used by the dsp code by calling the approriate addButton, addVerticalSlider, addNumEntry etc. methods (depending of what is described in the original Faust DSP source code). The control/UI code keeps those addresses, and will typically change their pointed values each time a control value in the dsp code has to be changed. On the dsp side, all control values are “sampled” once at the beginning of the dsp::compute method, so that to keep the same value during the entire audio buffer. Since writing/reading the FAUSTFLOAT* zone element is atomic, there is no need of complex synchronization mechanism between the writer (controller) and the reader (the Faust dsp object). Look as how the fslider0 field of the previously mydsp displayed C++ class is used in the mydsp::compute method, and how its value is read and kept in a local variable, before entering the actual sample computation loop. Active widgets are graphical elements that control a parameter value. They are initialized with the widget name and a pointer to the linked value. The widget currently considered are Button, CheckButton, VerticalSlider, HorizontalSlider and NumEntry. A GUI architecture must implement a method addxxx(const char* name, FAUSTFLOAT* zone, …) for each active widget. Additional parameters are available to Slider and NumEntry: the init value, the min and max values and the step. Passive widgets are graphical elements that reflect values. Similarly to active widgets, they are initialized with the widget name and a pointer to the linked value. The widget currently considered are HorizontalBarGraph and VerticalBarGraph. A UI architecture must implement a method addxxx(const char* name, FAUSTFLOAT* zone, …) for each passive widget. Additional parameters are available, depending on the passive widget type. Note that all the widgets are added to the current box. The FAUST language allows widget labels to contain metadata enclosed in square brackets. These metadata are handled at GUI level by a declare method taking as argument, a pointer to the widget associated value, the metadata key and value: **declare(FAUSTFLOAT, const char, const char*)**. They are used to add specific informations to be decoded by specialized UI interfaces (like OSCUI, MidiUI…). Those UI elements have firstly been defined to have a “graphical meaning”, but you can perfectly decide to control the dsp with a pure non-graphical controller. OSC (see faust/gui/OSCUI.h file) and HTTP (see faust/gui/httpdUI.h file) controllers are good examples of that approach. Developing your own architecture file typically means thinking on what part of your system is going to handle the dsp control state (by changing the value of each UI element), and what part is going to activate the actual dsp computation (by calling the dsp::compute method). Handling the dsp state can be done by a regular User Interface or a network based controler for instance. Dsp computation is usually trigerred by the real-time audio chain in a standalone application or plugin, but could be also be done in a pure deferred time context. Implementing a subclass of audio base class is usually done when producing standalone applications. In the context of a plugin, subclassing a given base “audio node” class part of the host audio chain is usually sufficient. Then developing a subclass of UI base class could also be needed. For audio you can look at the faust/audio/portaudio-dsp.h file that implements the portaudio class using the PortAudio API as as simple example. Other files in /faust/audio/ allows to use JACK, NetJack, CoreAudio, RTAudio, Alsa, OpenSL ES, etc API. GUI class provides additional mechanisms to synchronize widgets and zones. Widgets should both reflect the value of a zone and allow to change this value. FUI class used to save and recall the state of the user interface. This class provides essentially two new methods saveState() and recallState() used to save on file and recall from file the state of the user interface. The file is human readable and editable. faust -a your_architecture_file.cpp foo.dsp -o foo.cpp to create the new foo.cpp file to be compiled with a regular C++ compiler, and linked with the required libraries to produce the final executable or plugin. Note that you can possibly use the -i parameter to textually include all Faust related dependancies in the output C++ file. You may want to automatize all build steps like invoking the Faust compiler, then the C++ compiler, and possibly additional steps. See scripts located in the tools folder as possible examples. We’re happy to announce Romain Michon’s new Faust online course based on the “Audio Plug-Ins Designed with Faust workshop” that took place at CCRMA (Stanford University) on July 6-10 2015. It aims at giving a broad introduction to digital signal processing and to the Faust programming language. By the end of this course, students should have a full collection of plug-ins usable in various DAWs and computer music environments. While previous experience in programming is helpful but not required to take this course, we expect students to have basic notions of algebra, calculus and to have some experience using computers to make music. Tossed but not sunk. Ten months after January 2015 shouting at Charlie Hebdo and Hyper Casher, Paris has been again attacked. We are at war against Islamic fundamentalism, a particularly cowardly enemy who kills disarmed people in newspapers, planes, supermarkets, beaches, museums, concert halls,… We are at war against religious obscurantism in all its stupidity and all its inhumanity. Our thoughts go to the victims and their family. In this example we will see how to write a simple organ base on a sine oscillator described here. The polyphony and the MIDI control will be handled by the architecture file. We will only have to describe a single voice and adopt special conventions on widget’s names for the architecture file to know how to map incoming MIDI messages. In this example we will see how to write a sine oscillator. The main component will be a “phase” generator. In this expression 0.1 is the increment between successive samples, and fmod is the floating point remainder operation used to wrap the signal between 0 and 1. By controlling the increment we can control the frequency of the generated signal. Let say that the sampling rate is 48000 samples per second. By using an increment of 1/48000 we will produce a signal at 1 Hz, and by using an increment of f/48000 we will produce at frequency f Hz. Instead of hardcoding the sampling rate, we can use the SR primitive defined in the math.lib library (as a foreign constant to be setup with the actual sample rate by the architecture file) in the definition of phasor. This lead us to the following program. The Faust Online Compiler is back in a simplified and faster version! It allows you to edit and compile your Faust code directly from a web browser. Try it at here. The tool faust2md provides an ultra simple documentation system for Faust. It extracts the comments from a Faust file and creates a documentation file based on the lightweight markup language markdown. The basic usage is faust2md [-t 4] [-c] [-f] foo.dsp > foo.md. The option -t n can be used to change the default tab setting. The option -c can be used to include the faust code itself into the generated file. 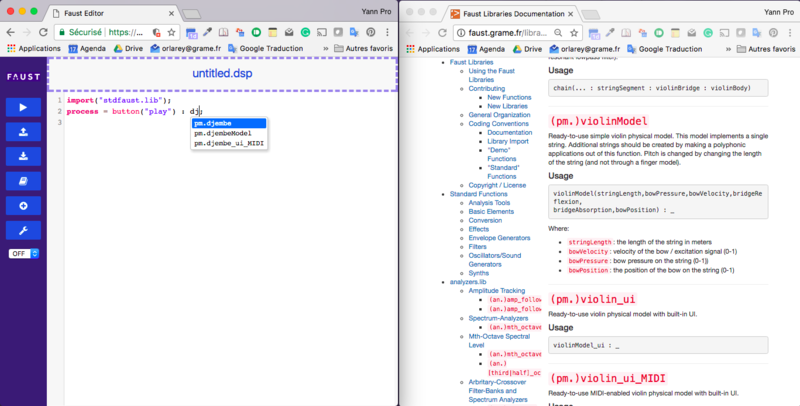 The option -f adds a YAML front matter at the begin of the documentation file. Welcome to Faust’s new website. It is a static website build using Jekyll. The source code of the website is on Github faustwebsite. Periodically the server do a git pull, then rebuild the website using jekyll build and copy the generated site using rsync. Use jekyll serve to run the server locally (http://localhost:4000/). PMix, a graphical patcher, preset interpolator and JIT compiler for Faust by Oliver Larkin. Many thanks to all the participants, to the members of the committee, and to Albert Gräf and the Linux Audio Conference 2015 organization team. GRAME is happy to announce the first Faust Open Source Software Competition ! Faust Open-Source Software Competition is intended to promote innovative high-quality free audio software developed with the Faust programming language. 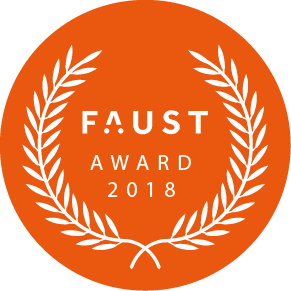 The Faust Open-Source Software award will be attributed to the best submission by an international committee of leading experts in the field. The competition is sponsored by Grame, centre national de création musicale. The winning software will receive a 2000€ price to encourage its authors. The results will be announced during the Linux Audio Conference 2015 in Mainz. Authors are encouraged to prepare a video demonstrating the software as well as any useful documentation, including examples of how the provided software might be used, existing prototypes that use the software, download statistics or other public usage information. The criteria for judging submissions includes broad applicability and potential impact, novelty, technical depth, reusability, etc. A permanent link for the open source software (e.g., Sourceforge, GitHub, Google Code, etc.). A permanent link for the video demonstration (e.g., Youtube, Vimeo, etc.). A link to a compressed archive file that contains the software (source code, documentation, build/install instructions, and licenses. Comprehensive and clear build/install instructions will be a crucial component of any submission. The committee will make reasonable effort to build the software for the top contributions, but if they are unable to make the software run, it will be excluded from the competition). We are happy to publish a new and improved version of the Faust to Web Audio API development. While faust1 version (= master branch on GIT) Emscripten SDK has to be installed before using the following scripts. Whith faust2 development branch, a internal asm.js backend has been developed to directly generate the code starting from the DSP source. So you will be able to either generate the asm.js code using Emscripten (by adding the -emcc parameter in the following described commands), or using the internal asm.js backend. Where ‘update_handler’ is a function with a prototype (path_to_control, value) that will be called once at each audio cycle with output control values. GRAME is happy to announce the official release of FaustLive ! 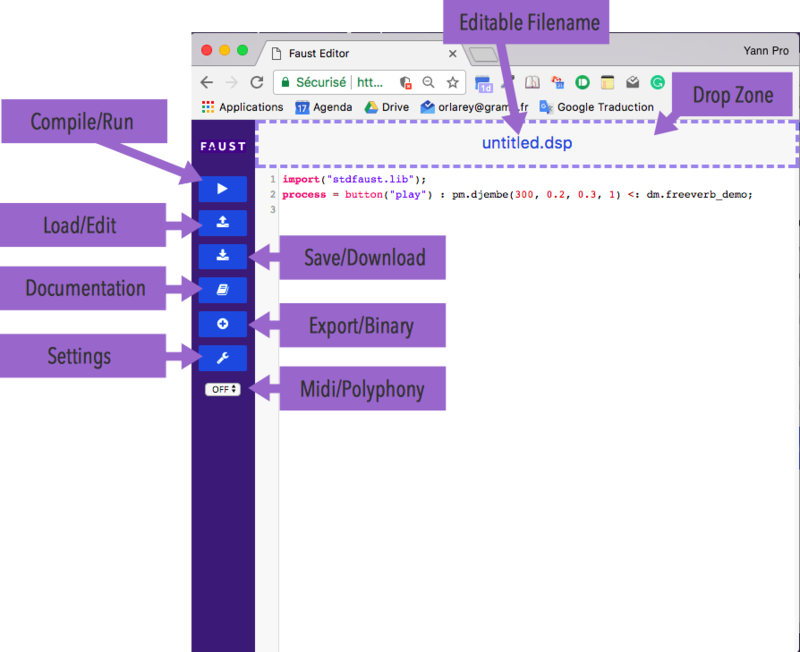 FaustLive is an advanced self-contained prototyping environment for the Faust programming language with an ultra-short edit-compile-run cycle. Thanks to its fully embedded compilation chain, FaustLive is simple to install and doesn’t require any external compiler, development toolchain or SDK to run. FaustLive is the ideal tool for fast prototyping. Faust programs can be compiled and run on the fly by simple drag and drop. They can even be edited and recompiled while running without sound interruption or JACK disconnection. On FaustLive’s windows you can drop your Faust code as a file, a string or a url. The code will be dynamically compiled and executed. You can then choose to edit your code. It will be opened in the default editor for .dsp files (FOLLOW THE README TO CONFIGURE FILE ASSOCIATION). The application will be automatically recompiled, every time you save your document. A crossfade is calculated between two relaying applications in a window to avoid brutal sound interruptions. Exporting your DSP as plugins is easy, thanks to FaustWeb, compilation service. In FaustLive’s export menu, you can find every platform and architecture that Faust can target. As you choose your target, your code is sent to FaustWeb and you receive the requested binary in exchange. import the snapshot : adding the saved state to the current state. In the Windows Option toolBar, you can open a UDP port for OSC control or a TCP port for HTTP control. Moreover, the HTLM interface can be accessed through a QrCode that you can create from «View QrCode » in the menu « Window ». GRAME is happy to announce the release of FAUST 0.9.67 ! This release provides many bug fixes and improvements in several architectures (Audio Units, VTSi, etc.) and libraries, as well as two very exiting new tools. The two following ones are polyphonic instruments that can be controlled with MIDI. Check them with Chrome (don’t forget to activate Web MIDI API). faust2owl allows to develop effects for the OWL programmable effects pedal. See http://hoxtonowl.com/ for the pedal, and a short demo of a wah wah effect here. 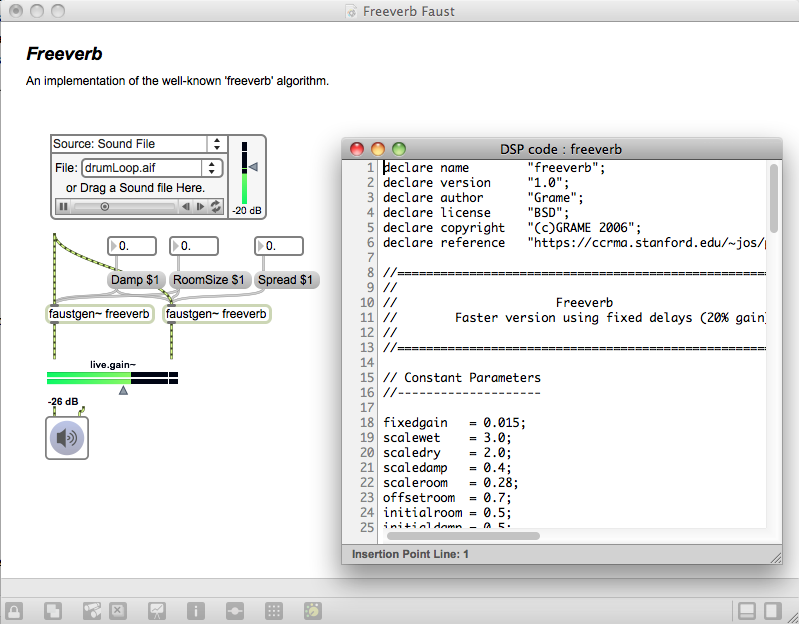 GRAME - Centre National de Creation Musicale - is happy to announce faustgen~, the Faust compiler embedded as a Max/MSP external, available for OSX and Windows. Thanks to the awesome LLVM technology combined with libfaust, the new library version of the Faust compiler, Faust DSP programs can now directly be compiled and executed on the fly at full speed. The Faust DSP source, compiled by libfaust using the LLVM backend, produces an intermediate representation (as LLVM IR), to be compiled and executed as native machine code directly in memory (using LLVM JIT technology). The LLVM IR can itself be optimized (using “optimization passes” in LLVM terminology), and the JIT component can be configurated to produce the best possibly native machine code. This compilation chain has been experimented in faustgen~, an external for Max/MSP. Faustgen~ allows to easily use Faust source code inside a Max/MSP patcher, edit it, change compilation options, and even produce the processor flow chart as an SVG diagram. Preliminary tests show that the resulting native code runs at speed comparable to what the previous static compilation model was achieving. For Pure Data, Albert Graef pd-faust dynamic environment can be used. We hope similar implementations will be available in the future for Supercollider and Csound.